Though the fishing industry defines Smith Island today, the island was first used by English settlers in the 1600's to graze livestock. A wonderful unique island dialect persists on Smith Island that originated with these settlers. Captain John Smith charted the area in 1608, calling it The Russell Iles, in honor of the physician who saved him from a stingray's poisonous barb during his voyage. Subsequently, Henry Smith of Jamestown was granted 1,000 acres in 1679 and the area became known as Smith Island. In the mid-1800s, oystering and crabbing became the predominant industries, with oystering filling the watermens' days during the winter months until the crabbing season kicked into gear in May. 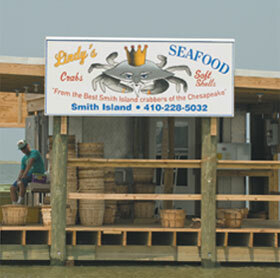 With Smith Island's proximity to the Virginia state line, the harvest of oysters in one state or another was often contentious, and the states' boundary line was redrawn several times due to oysters. The marked decline of the native oyster population throughout the bay due to pollution, over harvesting and disease has greatly reduced oystering, and the island's way of life is now primarily dependent on the crab harvest. The first Methodist camp meeting was held on Smith Island in 1887, and the church continues to play a significant role in island life today. Many of the functions that would ordinarily be performed by town governments are taken care of either by the churches or by volunteers on the island. The three villages that constitute Smith Island have withstood the bay's persistent erosion. Some of the houses have been moved from other parts of the island where erosion became a reality. "Progging" or hunting for treasures at the water's edge, is often rewarding due to the subtly shifting shoreline. Along with wildlife discoveries, proggers frequently find Indian arrowheads, artifacts and bottles from earlier settlers.